(CNN) - It's a fundraising showdown in one of the nation's high stakes Senate contest this year. Democratic challenger Alison Grimes' campaign announced Tuesday it brought in over $4 million in the past three months - the most a senate candidate in the state has raised during a quarter fundraising period - with $6.2 million cash on hand. But the reelection campaign for five-term Republican Mitch McConnell, the Senate minority leader, is also touting record-breaking fundraising numbers. McConnell's campaign reported it raised just over $3 million this quarter, nearly $1 million less than his opponent. Still, the longtime senator has more money in the bank and brought in more this election cycle. 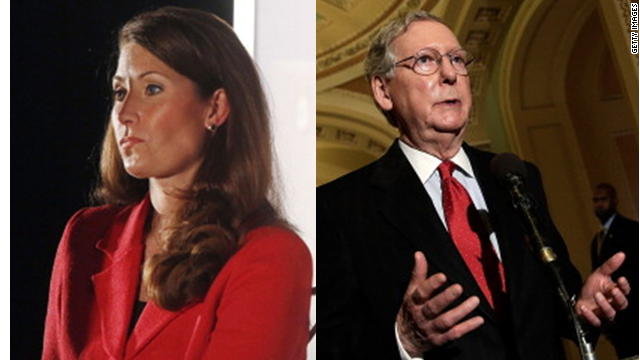 In fact, McConnell's campaign boasted it raised $25 million this cycle - the most a senate candidate in Kentucky has brought in during a cycle - with $9.8 million cash on hand. Those record-breaking numbers could make all the difference with polls showing Grimes, Kentucky's secretary of state, and McConnell locked in a tight race as the months dwindle down to November. Both sides said their exceptional fundraising results show their respective candidate is well-positioned to win the highly sought after Senate seat, as Republicans hope to break through the Democratic majority in the upper chamber. Democrats have a 55-45 majority in the Senate (53 Democrats and two independents who caucus with the party). But in the midterms, the party is defending 21 of the 36 seats up for grabs, with half of those Democratic-held seats in red or purple states. Kentucky and Georgia are the only two states where the Democrats hope to go on offense. Grimes is an Obamadroid that supports his War on Coal which will devastate many hard working American families in Kentucky and West Virginia. Why would anybody actually vote for the destruction of their own livelihood and possibly their entire family by voting for a Democrat? Finally, legislation to deploy units like the Texas National Guard to the border, something which Texas Gov. Perry could have done at any time that he wanted to. The POTUS would need an act of Congress to do it and Republicans know it, but they hammered him on it, anyway. It made for really great sounding, but extremely misleading, sound bites. But Rudy, as you and all the other lefties have pointed out, and Obama has even sued states about it, enforcing our immigration laws is the duty of the federal government. Certainly protecting and defnding our borders is a federal responsibility right? Border Patrol is federal right? Why now all of a sudden do you clowns want to say a Governor should be doing something? This is a FEDERAL FAILURE of massive proportions thanks to Obama. Goodbye Mitch. You are toast. I like it. They're creating jobs. Unfortunately, I do not like the idea of Grimes introducing herself, although she should already be known throughout the state, with a negative ad in the lead-off position. First impressions are lasting. She is, huh, so you know what she stands for more than her yup, your a gop alright, reality be damned. -this illegal invasion is GOP disaster. Drive this old thug of republican home, KY. Any democrat is better than these republican trash. "Grimes is an Obamadroid that supports his War on Coal"
Please show me the ad where she is aligned with the President on coal. PLEASE!!!! We're waiting. With 20 million americans plus out of work . To put more gypsies on benifits just is not very smart ?And the dems still want longer unemployment extensions oxymorons . "the GOP plan aims to repatriate children in 5-7 days." HAHAHAHAHA. Teatroll Rosetta stone says: "Well, here we have the most defenseless, helpless, in-need type of illegal immigrant...an unaccompanied minor...so of course we can just completely obliterate any semblance of due process and just ship them off like animals. What the heck are they going to do about it if we just refuse to include any provision for them to be represented in our proposal and turn the whole thing into a farce, railroading them (literally) out of the country in an animal storage crate? For crying out loud...they're not even human. Someone call Mittens...maybe he'll stick a few of the crates on the top of his car and drop them off on his way to Acapulco..."
Mitch McConnell is a failure. He even failed to make President Obama a one term President. And Thank God Mitch Failed. The alternative would have devastated America!! Please Kentuckians, Please vote McConnell Out of Office asap. I know you like your ACA , Mitch voted against your ACA, please get rid of him!! @obumbles, these idiots already vote against their own best interest. southern states receive most of the federal government money that they say they don't want because of big government telling them what to do. The teaklan bubble people are really half brain dead. Ol' Mitch is darn lucky this isn't a beauty contest. Tommy G, in events like this, the National Guard falls under federal control. I guess you missed that part in civics class. when is grimes coming out with her ad embracing obamacare and saying if she was in washington she would have voted fror it too? when is it due out? it should be soon right? all the lefties in here are saying the democrats should run on obamacare so i'm sure she will right? "something which Texas Gov. Perry could have done at any time that he wanted to. " Yeah, but then he might not have quite the problem to blame on Obama...and he'd have to pick up the tab as well and, as well all know, paying for things is something GOPers NEVER EVER EVER WANT TO DO. Obtaining them is fine...especially if the benefits inure to the wealthy and white. Paying the bill afterwards is "spending" though and shall be frowned upon. It is known. Just look how they did us with Medicare Part D, Iraq and Afghanistan...or the Bush tax cuts, which were, in fact, SPENDING. Grimes will for women killing their babies and calling it womans healthcare so they don't feel bad about it. Lying to oneself is always the best thing to do, especially if you are talking about killing a baby. Democrats like Grimes are in full support of this.